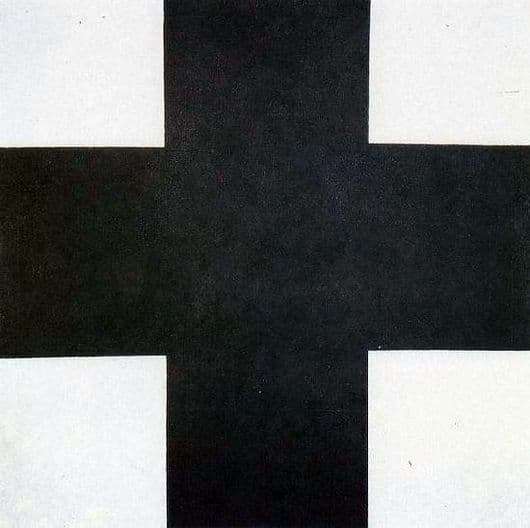 Kazimir Severinovich Malevich around 1923 created a picture of the Black Cross. Suprematic or otherwise, the highest highest and pointless image is this artwork. Again, once again the artist proves that his postulates are unshakable in relation to the development of new art. It is this new trend in his words that was to replace the traditional, the old. He believed that the characters should always remain unchanged, and this is the main thread that runs through the content of the whole picture. A new direction, called Suprematism, was also founded by Malevich. He always advocated simple forms. The master believed that they are the basics of the universe. This is a prototype of what exists in reality. The picture itself is written in square format. White background, and on it a cross with equal ends. All the attention of the artist focused on the texture of the picture. According to Malevich himself, the colors white and black are the embodiment of the inherent form of energy. White is a sign of pure action, and black is an economic sign. Only these colors, as well as red, do not have pressure on the aesthetic component of color, they are, as it were, original in themselves.